Yesterday morning’s prayers got off to a rough start. Instead of thoughtfully considering my thoughts and needs, I got off onto a real rant and vent. It was not a productive way to pray nor did it accomplish anything except to make me more upset and frustrated. I also found it very disrespectful to speak to God that way. There were multiple reasons for me being so bummed. It was a beautiful day outside and I resented going to work, even though the weekend had been equally beautiful and I spent significant time outside. This is tax season, so there is the stress of getting returns out. Also I was tired, not having slept well the night before. I had a wonderful day. Seriously! It was a great day and a wonderful reply to prayer. I stopped at Kroger to get some flowers on my way in to work. As I walked back to my car, the bread delivery guy gave me a big smile and laugh and said, “Thanks, but I don’t deserve them today!” I assure him he deserved them and we both laughed. I gave the flowers to my employee who was back for her first day since going on maternity leave. I figured there would be enough tears about going back to work and wanted to make her smile. She was thrilled and it did help her first day back. By lunch, returns were reviewed and in processing, and everything slowed down for a few hours. I went out for a wonderful lunch (plus dessert! ), then took a short drive around Hollywood Cemetery to explore another section and take a few more pictures. An old friend called me in the afternoon. We’d lost touch after I left Omaha and I had a great 30 minutes catching up with him. I was in-between reviewing returns when he called and the call cheered me up to no end. After a wonderful supper prepared by my husband, I started reading the new J.D. Robb book, New York to Dallas. I didn’t finish it in one night, but I enjoyed reading as I petted the dog laying in my lap. 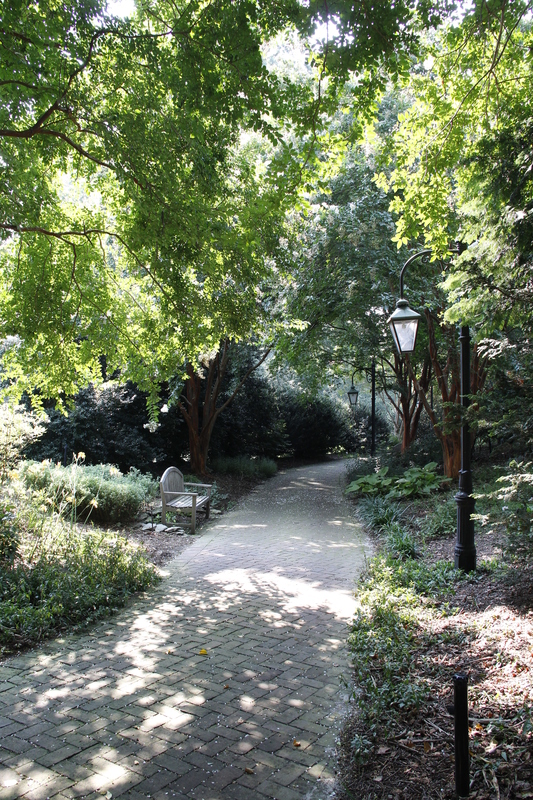 This photo is from the botanical gardens, a representation of how my day settled down into serenity. Except for that short time in the morning, it was a very very good day. Word for tomorrow – MOVED. If you prefer to work ahead, see the list for the week under “A Word A Day”.